AREAWIDE — Join Essex Steam Train for a unique night of refined pleasures on their Cigar & Whiskey Cruise. On Thursday, July 12, from 6 to 9 p.m., the Cigar & Whiskey Cruise (for adults only) will take an exclusive group of cigar enthusiasts on the Becky Thatcher riverboat for an evening of spirits, cigars, and delicious cuisine. This event will be held rain or shine. Guests board the vintage steam train at Essex Station for a ride to Deep River Landing, where they will embark on a two-hour sunset cruise along the Connecticut River while they sample premium whiskeys paired with a hand-rolled cigar for each passenger. Board the locomotive at Essex Station at 6 p.m. Train departs Essex at 6:15 p.m.
Riverboat Cruise runs from 7 to 9 p.m. Arrive back at Essex Station at 9:30 p.m.
Light hors d’oeuvres will be provided and additional spirits will be available for purchase. 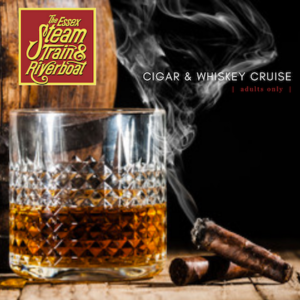 Included in the $85 ticket price ($95 at the door) is the initial train ride to Deep River Landing, two-hour cruise on the Connecticut River, a hand-rolled cigar, 1/2-oz. tastings of the night’s featured whiskeys, light fare, and an Essex Steam Train & Riverboat rocks glass. For more information and to reserve tickets, contact Pam Amodio at pamodio@essexsteamtrain.com or call 860.767.0103 or visit this link.